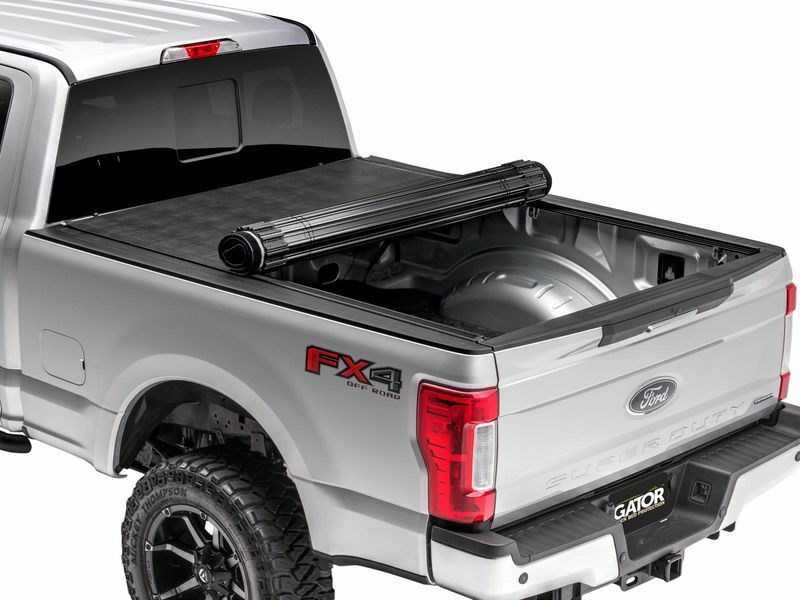 The Gator HR1 is a roll-up truck bed cover made from lightweight, aluminum slats that interlock to provide a strong barrier of protection for your truck bed. An additional slam latch is located in the middle of the cover to keep it locked in place when closed. The design of the HR1 allows access to 100% of your truck bed in a matter of seconds due to the functionality of a roll-up cover. The HR1 has an industrial-grade, soft vinyl top that is bonded to the aluminum slats. The vinyl has a leather-grain look and is UV resistant. The vinyl overlay adds extra weather proofing by covering the aluminum slats to keep water from seeping through the top. A pair of straps located at the front of the bed will keep the cover out of the way and secured while driving. The dual latches allow the cover to be opened from either side of the truck bed, and when closed, commercial-grade hook and loop fasteners seal the sides along the bed rails. In case rolling the cover up to the cab for full bed access isn't enough, the cover features a quick-release function to remove the cover without tools. The ease of a roll-up cover combined with the security of an aluminum hard cover makes the Gator HR1 a unique and practical cover. The HR1 is made right here in the USA, and installation is simple with the no-drill, clamp-on rails that help to stay level during installation.